The Wonder of the Mundane – He Said What?! Aaron is very fascinated with our pecan tree – not only because of the “pee-cons,” as he calls them, but because of the squirrels that run all over the yard. It’s fun to watch the squirrels zipping around with their jaws stuffed with our pecans. Aaron likes to pick the pecans up that the squirrels leave behind and then examine them. Most of them are just shells or are mangled up pecans that the squirrels or birds have handled. Rarely do we find a whole pecan that is undamaged. But today Aaron bounded in the house when he got home from his group. “Mom! I found a pee-con! It was new and had not been opened! !” He was so excited about this new, unopened pee-con that I had to laugh. He told me that he gave that pee-con to one of his friends in the van, which I thought was very nice. Somehow I’ve missed the nuts inside of my pumpkins! I went ahead and told Aaron that those nuts are really seeds, and that he could dry them and eat them too – but he didn’t like that idea. He continued talking about the next thing on his mind, which was the coconut that he saw. We’ve talked a lot about coconuts, and have bought fresh coconut before so he could open it and see the coconut milk and taste the fresh coconut. Yet what amazes Aaron the most is that hard coconut shell. Today was no exception. “Mom, that coconut’s outside is like metal or cement!” Now that’s hard!! “Yes, I did, Mom! I was razoning my finger!” And once again I told him to not pick up a razor, of all things, and do NOT razon his finger!! There is a reason I often pray for his safety! Why does he have to pick everything up that he sees?! He came down to join Gary and I for supper, and of course had to get more silverware, the napkins, the toothpicks – you know the routine as well as we do by now. And as he cut his steak, he placed something in his unused salad bowl. It was a piece of fat that he had cut from his steak. The fat could not stay on his plate, just like crumbs cannot stay in the same bowl or plate as his chips or crackers or whatever. One little piece of fat – but it’s too much to share the plate with his good food. And we know not to make a big deal of this. 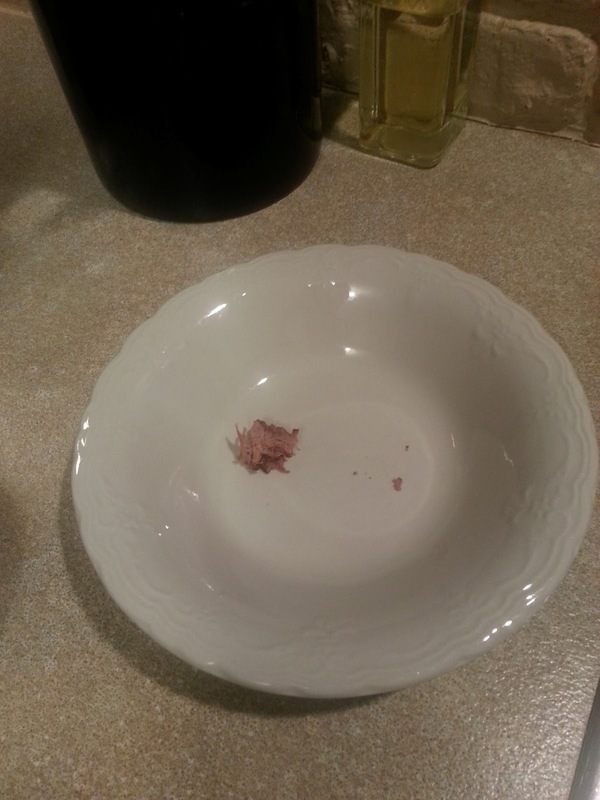 So he dirties a whole bowl for one little piece of meat. That’s why I have a dishwasher. It’s just part of what makes Aaron tick…….what makes Aaron unique…………what makes Aaron – Aaron. Without Aaron’s insight, I would never have known that pumpkins have nuts inside and that coconuts are like metal or cement. And his friend would not have seen the wonder of a new, unopened pee-con! Aaron makes the hum-drum details of life suddenly become full of wonder, at times. We just need to listen and learn from him. I need to remember to sometimes see my world like Aaron does, and share that wonder with others. Life is much more interesting that way! Previous Previous post: I’ll Take Seconds!